India’s current account deficit widened to 2.5% of gross domestic product in the third quarter, paced by an increase in oil import bills in the period under review. In the year-ago period, the deficit, or excess of imports over exports, was 2.1% of GDP. It widened to $16.9 billion in Q3 of FY19, from $13.7 billion in the same quarter a year ago. A detailed analysis of the trade data indicates that deficit in crude imports at $24.5 billion during the latest quarter was 30% higher than the deficit of $18.8 billion in the same period a year ago. The deficit is likely to narrow to below 2% of the GDP in the second half of FY19, taking full-year CAD to 2.3% or $60 billion, Singapore-based DBS said. Net services receipts increased by 2.8%, mainly on the back of a rise in net earnings from telecommunications, computer and information services and financial services. Besides, private transfer receipts, mainly representing remittances by overseas Indians, amounted to $18.7 billion, up 6.3%. In the capital account, foreign investments, including foreign direct investments and portfolio investments, were the largest sources of inflows at $5.4 billion during the quarter, compared with $9.6 billion in the same period a year ago. The overall surplus in the capital account totalled $13.6 billion, compared with a surplus of $22 billion in the same period a year ago. 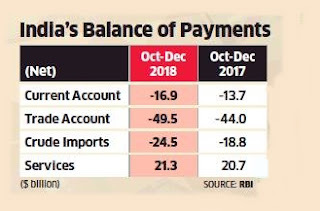 The overall balance of payments ended in a deficit of $4.3 billion, compared with a surplus of $9.4 billion in the same period a year ago.